CicLAvia is spreading its wings throughout the city. They&apos;ll be hosting their very first route through the San Fernando Valley on March 22. The event—which is basically a block party that shuts down streets to motorized traffic and encourages folks to bike, walk and skate through the roads—will give folks a chance to explore roads between North Hollywood and Studio City from 9 a.m. to 4 p.m. Some of the highlights include checking out North Hollywood Arts District, Universal City, the historic Campo de Cahuenga, Studio City Farmers Market and the historic Sportsmen’s Lodge. There will be a five-mile path that runs on Lankershim Boulevard between the North Hollywood Metro Red Line stop at Chandler Boulevard and the Universal Studio Red Line. Then it curves and runs along Ventura Boulevard between Campo de Cahuenga and Coldwater Canyon. 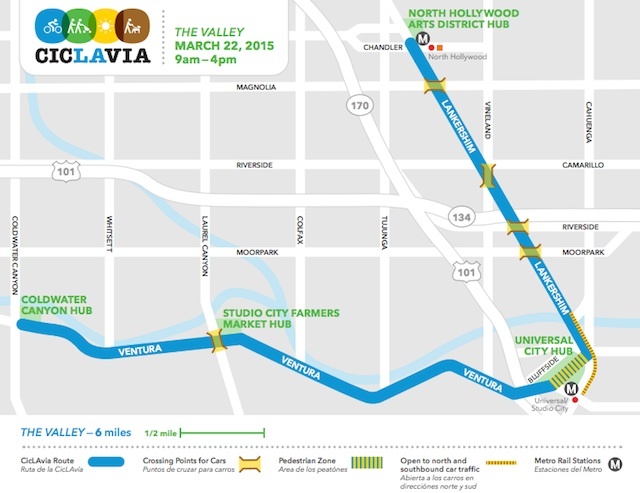 This time around, Metro has helped fund this SFV route of CicLAvia, as well as the upcoming ones in Pasadena on May 31 and Culver City/Venice on Aug. 9. Also, coming up in October (a hard date to come soon), is the popular Heart of LA route. And if you want to get a head start at checking part of the route before it takes place in a couple of months, CicLAvia is hosting a "Noshing in NoHo" walking and food tour from 10:30 a.m. to noon and 12:30 p.m. to 2 p.m.